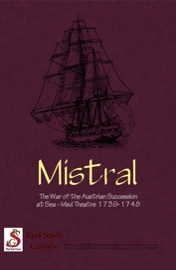 Mistral is the first of a set of games covering the War of the Austrian Succession at sea (plus the concurrent War of Jenkin's Ear). Though relatively unknown, these conflicts, raging from 1739-1748, comprised the first "world war". The primary naval actions took place in three theatres: the English Channel and Bay of Biscay, the Caribbean, and the western Mediterranean. Forces also clashed in India, along America's eastern seaboard, and in the Pacific. Each of the other games covers one of these theatres. Mistral examines the western Mediterranean, where Spain tried to keep her lines of communication open to her army in Italy, and France's Toulon Fleet continually harassed the British. 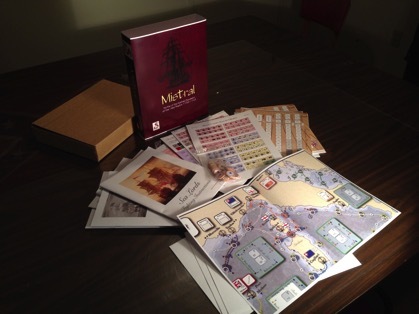 Mistral is a two player strategy game. You command either the British or Bourbon (French and Spanish) fleets. Orders are handed down to you from your Admiralty, and you must try to fulfill them within the framework of the wider war, which is represented by a set of events. Your opponent will have orders of his own to fulfill, but with his spare forces he will be attempting to foil your plans. Success will earn you Prestige (victory points), and may even have an impact on the land campaign. You must decide when and where to commit resources, where to feint and where to strike, organising your "sail" (ships) into squadrons, and your squadrons into flotillas commanded by leaders (commodores and admirals). Maintaining sufficient forces at "battle readiness" is critical, but very difficult, since ships constantly suffer wear and tear – a battle may be won and the campaign lost. Scenarios are one year (16 turns) long, playable in 3-4 hours (the number of counters in play is quite small). The campaign game consists of a number of years pre-chosen by the players. A special campaign scenario allows the players to link Mistral with its companion Lace Wars™ game Queens' Gambit. Every ship that appeared in the theatre is accounted for, as is every leader of note. (Although by the basic rules ships are generic "SPs", players can use the OOBs to add detail and even fight battles using their favourite tactical system). Squadrons are rated for movement and the number of sail they can contain. Specially named squadrons represent the great ships, like the 112-gun Real Felipe, which successfully beat off a simultaneous attack by three British ships of the line. 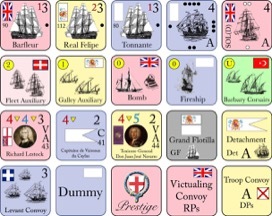 Other counters represent special assets, like fireships, frigates, and galleys. These can be "played" (like cards) to conduct special tasks such as search and shore bombardment. Leaders are ranked, and rated for skill and personality. 1) One map representing the Western Mediterranean of the 18th Century. The map uses a point-to-point system of movement based upon the various prevailing winds. 2) 360 die cut counters plus (in the boxed version) about 25 wooden disks. These represent the British and Bourbon squadrons, leaders, and auxiliary assets.